Today’s sweetness is brought to us by this lovely and not to mention over-the-top cute “Dainty Little Bakeshop” themed party. What’s not to love? Styled by Kathleen of Spark + Twinkle, I’m beyond thrilled to bring you this detail-filled festivity that was perfectly captured by Jo Lim Photography. Sprinkled with Kathleen’s magic dust and some DIY labor of love by Hailey’s parents, they surely made this party a sight to behold. From Hailey’s highly-anticipated dessert spread to the unusual party details injected all over the venue, expect to see the unexpected. Actually, there are so many pinterest-worthy ideas here! Curious, keep scrolling down because I know it’ll be hard to resist. “Three years ago, we started a small home based baking business called La Petite Chef. The inspiration of the name and colors of our baking business was our daughter, Hailey. Baking has become a family bonding thing for us and Hailey loves helping out – from measuring, mixing and even packing. How cute is that? Check out this uber cool 1D detail at the entrance. Have you seen anything like this before? No? Neither have I. From the stage backdrop to the ceiling details, the sketch pad-ish idea works amazingly pretty! Everything looks fantastic, such an eye-candy! The flowers added a nice girly feel to the ambiance. It’s a simple and effective way to instantly spruce your table setting. You can’t fail to love Hailey’s eye-catching cake on cake birthday cake (makes sense?) and all those yummy-looking and perfectly crafted sweet treats. I can’t imagine a more perfect baker themed party activity than this – decorate your own cookies. For the giveaways, these DIY prettified jars filled with more sweets look great. Here’s pretty Hailey and her wonderful parents. Caterer: Center Table Catering Inc.
Food Carts: Serenitea, Potato Corner, Nacho King, Dirty Ice Cream by Mr, Sun Kiddie Party Com Inc. 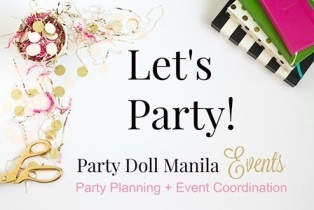 I like this simple but very dainty theme for a little girl’s birthday bash. I pick up so many ideas from the parties you feature. My daughter will turn 18 in 2 years and I know it’s a long way but it’s nice to just pick up some ideas here and there and see what we can incorporate on her debut!